Home > News & Events > Coming This Sunday at PEACE > Reformation continues today! We celebrate five centuries of God re-forming his people! At PEACE Lutheran Church, we look forward to God leading us into new Promised Lands – right here in Grass Valley, Calif.
On Sunday, Oct. 28, we celebrate Reformation Sunday. But the work of reformation continues all year long. During the weekly Sunday School hour, Youth @ PEACE takes a deeper look at Martin Luther’s Small Catechism. We prove that learning the 10 Commandments is fun (seriously!). During our two worship services – at 8:30 & 11 a.m. – we feature stirring music. It’s a great Lutheran tradition! Selections include compositions by Luther himself. “When Martin Luther posted his ‘Ninety-Five Theses”’ or ‘Disputation on the Power and Efficacy of Indulgences’ in Wittenberg on October 31, 1517, the resulting debate about Christian teaching and practice led to changes that have shaped the course of Western Christianity for almost 500 years,” according to the Evangelical Lutheran Church in America. 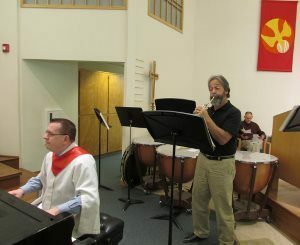 PEACE organist Walt Strony and member Phil Richardson offer special music during the celebration of Reformation Sunday. “At the heart of these wide-reaching changes was a deep conviction that God’s mercy or grace in Jesus is given freely to all. When Luther and others learned to trust God’s mercy with ‘a living, daring confidence,’ they discovered in that faith the freedom to give themselves generously, lovingly in all of life’s undertakings with everyone they met.” – From www.elca500.org, the official website of the ELCA celebrating the 500th anniversary of the Reformation. For more about the Reformation celebrations, click here. To link to the 500th anniversary celebration’s Facebook page, click here. Parents are the most important teachers in a child’s life. Martin Luther knew that — he had children of his own! He wanted to help prepare parents to understand basic principals of Christianity. Did you know? The word “catechism” means “echo back.” It uses a question-and-answer format to teach by thinking and speaking about the topic. To Luther wrote his “Small Catechism” as a guide for parents and anyone wanting to understand the basic tenets of the Christian faith. Click on the link to read it. Luther’s “Small Catechism” covers the 10 Commandments, the Apostles’ Creed, the sacraments of Baptism and Holy Communion, and a simple ritual for confession and forgiveness. Want a printed copy of the Small Catechism? Please, just ask!